Dave Conway has officially been in the furnace business since the mid-70s, and started his own business, Recycling Services International, in 1990, but he said that he has “always been around the recycling business.” He grew up on a farm and often brought farm scrap to a local scrap dealer. As a teenager, he made money by cutting up old farm equipment for other farmers and taking that material to scrap dealers. When he started his own company, he said that he enjoyed designing things and seeing them work. “It’s a challenge and that’s what I like.” The company makes different furnaces depending on the final use, as well as the customers’ needs. Aluminum-melting furnaces are larger than those for melting precious metals, and can hold up to 12,000 lbs. of molten aluminum. When automotive parts with both aluminum and steel go into the aluminum furnaces, those furnaces produce high-quality ingot and also clean steel that can be sent directly to steel mills with no further processing. The furnaces designed for recovering precious metals don’t melt the metal at all – they burn off the resins and combustible materials so the metal can be recovered. 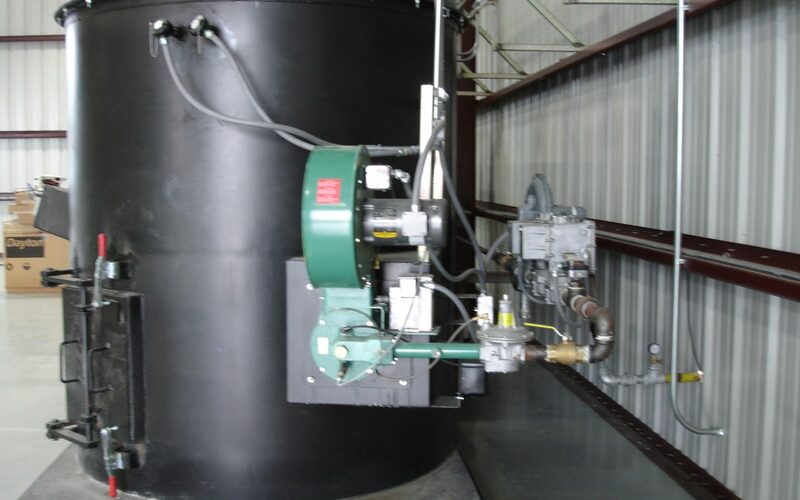 The furnaces designed for destroying PCBs from transformers have a 20-million BTU burner so the afterburner reaches 2300 degrees to eliminate any pollutants. The company also builds furnaces for melting lead off of copper wire and can also design and build furnaces for specific customer needs. The environmental issues are also one of his great interests, and he thinks that it’s a “joint venture cleaning up the air,” with the EPA, product designers and businesses all playing roles. “Recycling is a good thing,” he said. Conway said his customers are his best salespeople, and that it’s not unusual for current customers to invite potential customers to their facilities to see the furnaces in action and to explain how they work. Some of his customers own more than one furnace. He sells throughout the United States and he also ships overseas, but it’s not just about selling. When a customer receives a new furnace, they also get comprehensive training on how to use the furnace, how to maintain it and how to prepare reports for the EPA. That training usually takes about a week. “We have built-in diagnostics,” Conway said, which makes troubleshooting much easier after the training is done. To help with EPA regulations and reporting, the furnaces are fitted with dataloggers that monitor the afterburners that burn off potential pollutants. Conway also provides the customers with a spreadsheet with formulas for reporting the information from the dataloggers. Conway said, “It’s a lot of paperwork,” but it’s what needs to be done to stay compliant with the regulations, so his company does everything possible to make it easier for his customers. While other countries might not have the same sort of rules in place, Conway said that he enjoys “helping other cultures that weren’t concerned about the environment” and seeing them become more aware of environmental issues. The company has five employees who design and manufacture the burners and controls, while a fabricator builds the shell which is shipped separately to the customer, along with the lining material. The furnaces are built on the customers’ site, which takes about four weeks. Conway said that since they started shipping the furnaces in pieces rather than fully assembled, they’ve had no warranty repairs. When the furnaces were shipped fully assembled, there was always a chance for damage during shipping. While many of his customers are established in the recycling industry, recently he helped a startup business, including helping them with networking with others who could give them a hand. “If I don’t know something,” he said, “I know someone who does.” He was quite pleased to see that new business become a very successful startup. Conway realizes that not every company treats its customers with that sort of care, but it’s part of his philosophy. “We build relationships,” he said, and he looks for vendors who take care of him the same way he takes care of his customers. Because of that, he has long-term relationships with many vendors – from sellers of simple nuts and bolts to those who make more complicated relays.